In fact, Graph Search is encroaching on some of LinkedIn’s territory, making it easy for Facebook users to identify friends, friends of friends and complete strangers who work at (or worked at) their target companies. The new Graph Search, which finally rolled out to all U.S. English-speaking customers last week, allows users to search Facebook’s voluminous database to uncover content and preferences that have been posted through the years. Looking for contacts at Barnes & Noble? 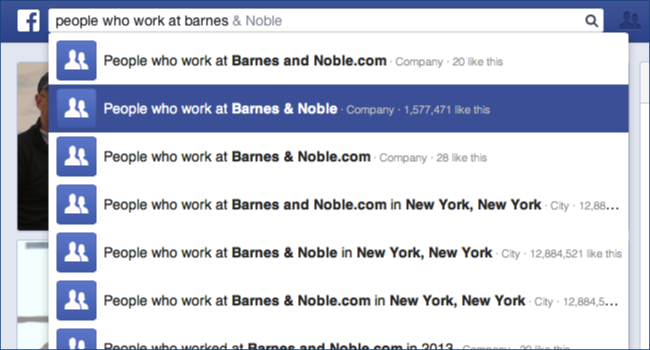 Go to the Facebook search box and type “People who work at Barnes & Noble.” The results will show people who have self-identified as working at the bookseller — whether you know them or not. You can sort the results a number of ways, looking for people in certain geographic regions, people who are already your Facebook friends, or people who are friends of your Facebook friends. In fact, you can start the search that way, typing “Friends who work at Barnes & Noble in New York City,” for example. Friends, of course, are easy to get to on Facebook. But can sometimes get clues on how to connect with people you don’t already know. If someone in the result set knows one or more of your Facebook friends, you’ll see that information in the search results — and then you can use your friend to get information about or connect to the the person on the inside. It’s kind of like using your first-degree connection to reach a second-degree connection on LinkedIn. Facebook Graph Search is not the perfect solution to your job search, but it’s a useful tool for your arsenal, particularly if your colleagues have missed the importance of LinkedIn. And while Facebook is making it easier to find potential business contacts, that doesn’t mean those people want to be found. Facebook, after all, is a primarily personal/social endeavor. People who want to network for work gravitate, appropriately, to LinkedIn, curating a search-friendly marketing profile and nurturing a network that can help. But the job search is social these days. And the friends of your friends may just give you the insight you need for the job you want. Have you used Graph Search? And more importantly, have you checked your Facebook privacy settings to control what others can find out about you?